iFixit has completed their teardown of Apple's new multi-touch Magic Trackpad, finding that the very thin device is bound by copious amounts of glue, making it difficult to disassemble. Released on Tuesday the $69 Magic Trackpad offers users the ability to use multi-touch gestures on a desktop Mac or PC. The hardware is a very thin profile made up of smooth glass and aluminum. In its teardown of the Magic Trackpad, solutions provider iFixit found that the new hardware follows a trend of recent Apple products: "thin and pretty = not user serviceable." The trackpad, does, however, offer a user-replaceable battery, as the wireless Bluetooth hardware relies on two AA batteries for power. Simply twisting the battery door on the rear left of the device with a flathead screwdriver allows access to the batteries. Though the Magic Trackpad surface is 80 percent larger than the trackpad found in current MacBook Pro models, the hardware's touch panel is just 0.5mm thick. Prying the lower panel of the hardware away using a plastic opening tool, iFixit had to slice its way through adhesive to disassemble the hardware. Inside, the device includes a spacer, which prevents the lower panel from squeezing against the logic board and damaging it. Removing the two ribbon cables that connect the capacitive touch pad to the logic board was said to be difficult, as the cables are very thin and are stuck to the underside of the touchpad. Removing the outer touchpad from the device's aluminum chassis required the use of a heat gun to warm up the adhesive that holds the hardware together. "This is not for the faint of heart," they wrote. "A copious amount of heat, guitar picks and plastic opening tools were required to make this thing bulge." iFixit also noted that the Magic Trackpad has a unique way of triggering the mouse button —pressing down on the hardware actually clicks the two rubber feet on the front of the device. Pressing down pushes up on a hinged plate and set screw, squeezing an electronic mouse button switch and creating a familiar "click." Completely removing the logic board requires desoldering of the four wires that lead to the battery connector and status LED, as well as the removing of two Phillips screws. 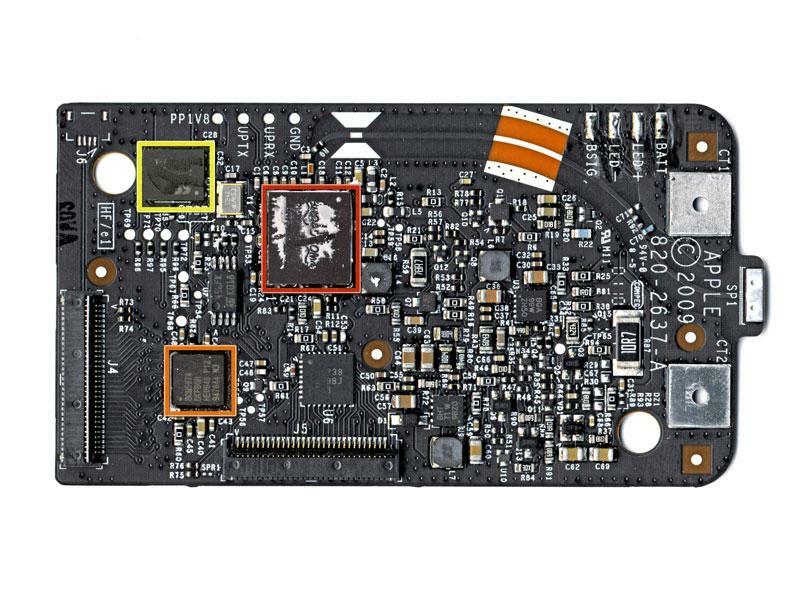 The logic board includes a Broadcom BCM2042 chip for its wireless Bluetooth connectivity —the same chip found in Apple's multi-touch Magic Mouse. In addition, the hardware's multi-touch functionality is provided by a BCM5974 chip, the same found in the iPhone, iPod touch and MacBook Air. Finally, the SST 25WF020 has 2Mbit of serial flash memory. 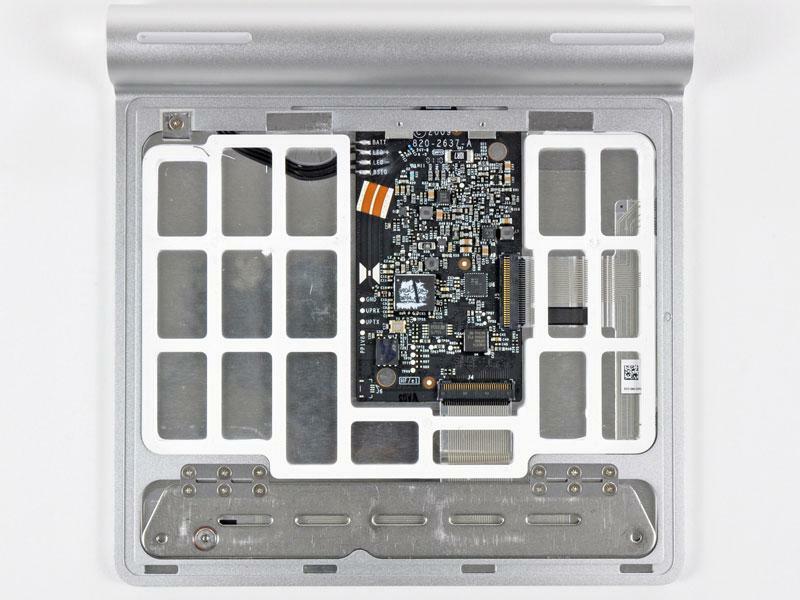 For more, see the complete list of details and photos at iFixit. In addition, see AppleInsider's review of the new Magic Trackpad.